“Submerged” is a professional development research project bringing together Indigenous and non-Indigenous artists and curators from across Canada for a 5-day arts-residency in Cuba followed by a 2-day creation event in Toronto, Canada. Collaborative research time will be spent exploring regional contemporary practices and creating collaborative works between artists and curators. The result will be new works created outside of Canada reflecting upon the Canadian arts ecology disseminated digitally through online publication. Statement: Geography informs practice. Arts-based cross-cultural collaborations raise awareness, promote inclusion and the importance of cultural pluralism within Indigenous arts. “Submerged” exchanges ideas about regional disciplines shifting in relation to the context of “national” identity. We migrate these ideas around local, traditional and contemporary practices always referencing the land we occupy and the land being occupied. “Submerged” is a gathering taking place both within Canada and outside, looking at the Canadian arts ecology from afar. It brings together forward thinkers to conduct collaborative professional development and consider possible futures. 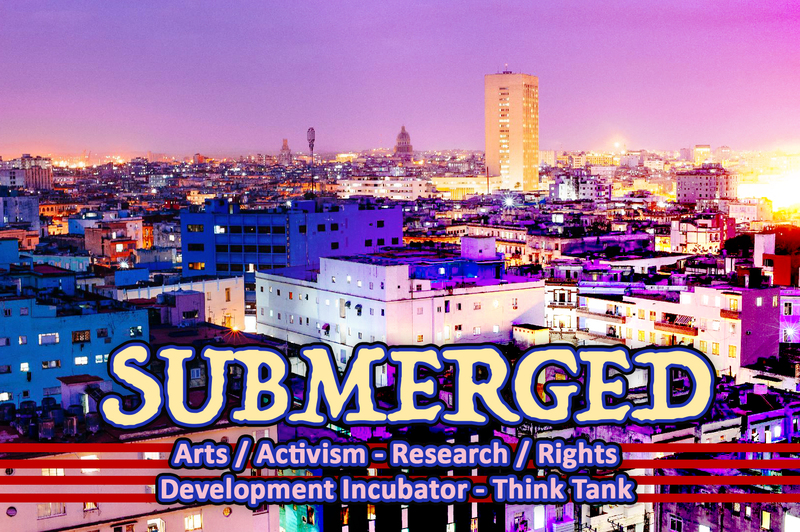 In December 2017, Submerged will be taking place in Cuba. Cuba, “discovered’ by Christopher Colombus on October 28th of 1492 after he disembarked from his first trip toward the “New World”. Cuba is considered the first points of contact for colonization in North America. Submerged Participants traveling to Cuba removes local context taking the submerged environment of Canada away in order to be able to look at the Canadian context more clearly at a distance. Adding the point of contact for colonization and engaging with participants with family connections to the region will lead to professional development opportunities, challenges, provocations and the creation of meaningful statements of text and image. Through the documentation of these actions, sharing contemporary methodology and disseminating messages will change Canada. Increasing the level of critical discourse within Canada, especially in relation to Indigenous issues should be the top priority for all Indigenous artists and curators. With an era of “(re)conciliation” and more arts leadership needed informing the public of systemic issues easily found within almost all areas of institutional language what Indigenous rights-based conversations can be shared between Indigenous and non-Indigenous peoples. Participants of “Submerged” are challenged to reflect and disseminate challenging ideas pushing for a higher level of consideration, discourse and understanding.